Travel journals don't have to be dry accounts of the name of the hotel where you stayed the night, how much you tipped the guide, and whether or not it rained during your hike in the English countryside (although you CAN include those if you want). This journal illuminates ways to make even a mundane experience fascinating. For instance, a close-up of ordinary purple flowers hanging over the edge of the restaurant roof reveals them to be as beautiful as orchids on close examination (click on images to see larger versions). 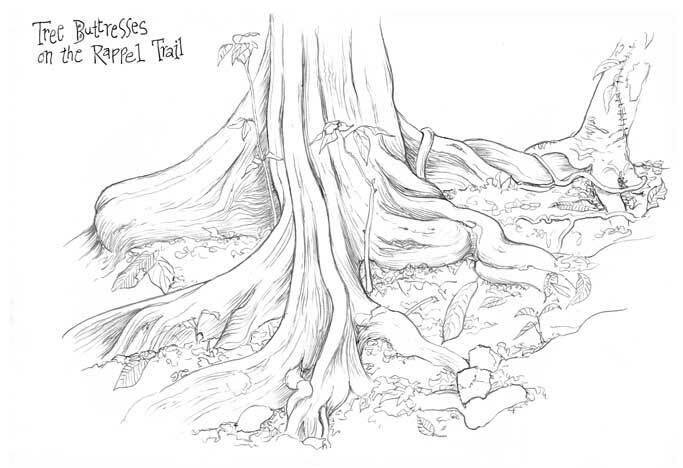 Nervous about drawing in front of strangers? Take photos with your digital camera and draw from the screen later as you hang in your hammock or while away the evening in your hotel room. The sloth on the cover (above) and the water buffalo (below) were sketched from a 2"x2" viewscreen while sunning by the pool. 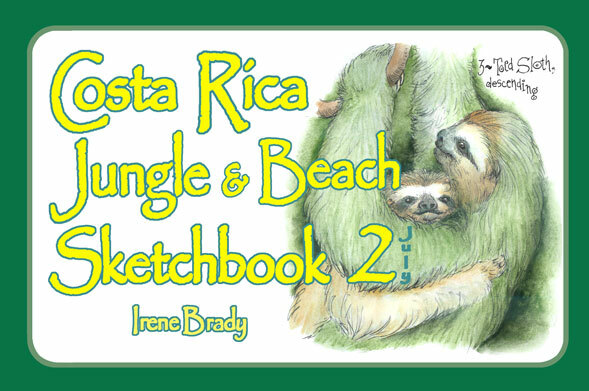 This journal of Irene's July adventure in tropical Costa Rica shows you how to add life and excitement to your sketch journal. It's FULL of great ideas to spice up your writing and drawing. 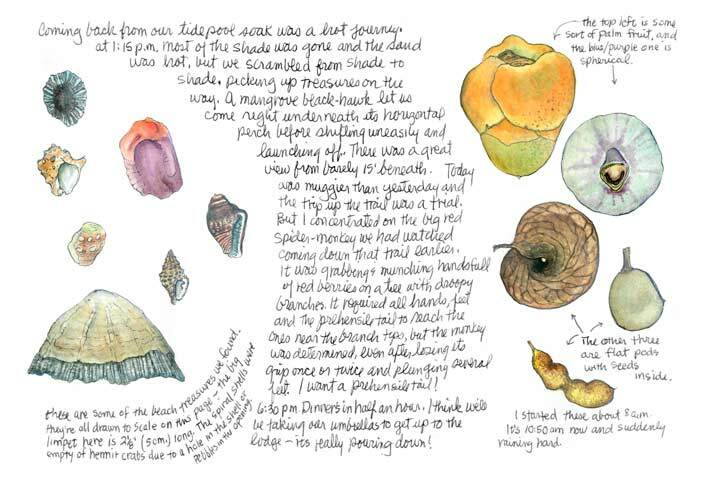 The journal and sketches give you close-up glimpses of screaming parrots, javelinas snorting along a jungle trail, seashells picked up on the beach, an origami-style cricket fashioned from palm leaves by a hotel waiter, a pure white bat hanging in the rafters, and even street decorations in the capital city of San Jose. 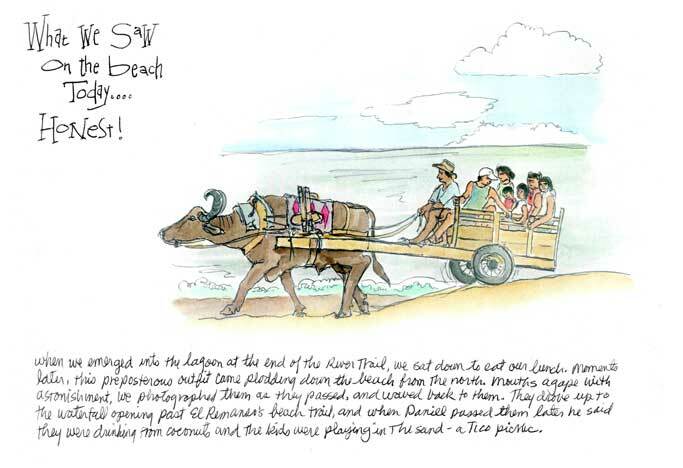 Enjoy her astonished journal entry when a water buffalo pulling a cart full of picnickers lumbers across the beach in front of her. Stand with her in the surf as she sketches the jungle at the ocean's edge. You'll find yourself awash with fresh ideas about how to bring your own vacation to life in sketch journals ~ ways to approach new subjects, ways to make them look great on the journal page, and inspiration for enhancing the pages in novel ways with glued-in items.